Annie Greene Wilkins, age 90, of Rutherfordton, NC, died Thursday, September 28, 2017, at Hospice House of Rutherford County. She was the daughter of the late William Avery Greene and Uzelia Keeter Greene and a native of Rutherford County. Annie was a member of First Baptist Church of Rutherfordton . 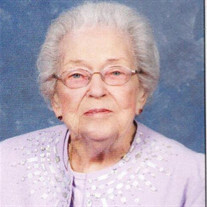 She was an active member of her church, civic organizations and community . She was a loving wife, mother and grandmother. Annie was preceded in death by her husband David Samuel Wilkins Jr. and two brothers; Bud Greene and Donald Greene. Four Grandchildren: Emily Wilkins, Erin Wilkins, Ben Wilkins and Merri Wilkins. The family will receive friends from 5:00 PM to 7:00 PM, Saturday, September 30, 2017 at McMahan's Funeral Home. The Funeral service will be at McMahan's Funeral Home Chapel at 2:00 PM, Sunday, October 1, 2017 with Reverend Tim Marsh, Reverend Dean Baughn and Reverend William Swink officiating. Interment will be at Gray's Chapel UMC Cemetery. In lieu of flowers memorials may be made to First Baptist Church; P O Box 839; Rutherfordton NC 28139, Hospice of Carolina Foothills; P. O. Box 336; Forest City, NC 28043 or Gideons International; Rutherfordton Camp 3214; P O Box 1462; Rutherfordton, NC 28139. The family will be gathering at the home of Bill and Gail Wilkins.